What do you think of the new design here on the blog? I thought it was time to give it a fresh look. Anyways, Halloween has gone, and not a photo in sight of the knight costumes I made the boys...I keep meaning to get them back up in costume gear, but things keep getting in my way. Like borrowing candy from their buckets. Or more like working feverishly on Christmas sewing. Patchwork stockings that I think I've mentioned before. 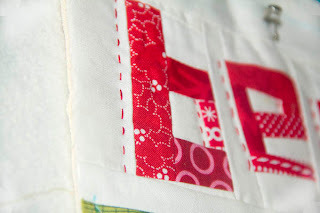 I love the look of the free pieced letters. I've added just a bit of hand stitching to give each a little personal touch. I'm so looking forward to the holidays this year, it has been a long year!